An international research team using a new combination of approaches has found two genes that may prove of vital importance to the lives and livelihoods of millions of farmers in a tsetse fly-plagued swathe of Africa the size of the United States. The team’s results were published in the Proceedings of the National Academy of Sciences (PNAS). With increased surveillance and control, sleeping sickness infections in people have dropped ten-fold in the last 13 years, from an estimated 300,000 cases a year in 1998 to some 30,000 in 2009, with the disease eventually killing more than half of those infected. Although best known for causing human sleeping sickness, the trypanosome parasite’s most devastating blow to human welfare comes in an animal form, with sick, unproductive cattle costing mixed crop-livestock farmers and livestock herders huge losses and opportunities. 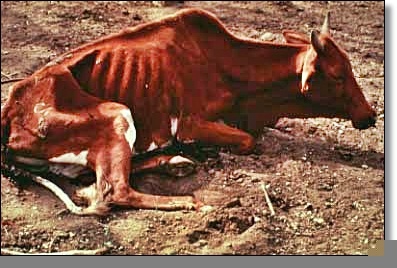 The annual economic impact of “nagana,” a common name in Africa for the form of the disease that affects cattle (officially known as African animal trypanosomiasis), has been estimated at US$4–5 billion. “The two genes discovered in this research could provide a way for cattle breeders to identify the animals that are best at resisting disease when infected with trypanosome parasites, which are transmitted to animals and people by the bite of infected tsetse flies,” says senior author Steve Kemp, a geneticist on joint appointment with the Nairobi-based International Livestock Research Institute (ILRI) and the University of Liverpool. African agriculturalists of all kinds would like to see the N’Dama’s inherent disease resistance transferred to these other more productive breeds, but this is difficult without precise knowledge of the genes responsible for disease resistance in the N’Dama. Finding these genes has been the “Holy Grail” of a group of international livestock geneticists for more than two decades, but the genetic and other biological pathways that control bovine disease resistance are complex and have proven difficult to determine. The international and inter-institutional team combined a range of genetic approaches, which until now have largely been used separately. They used these genetic approaches to distinguish differences between the “trypano-tolerant” (humpless) N’Dama, which come from West Africa, and “trypano-susceptible” (humped) Boran cattle, which come from Kenya, in East Africa. The scientists first identified the broad regions of their genomes controlling their different responses to infection with trypanosome parasites, but this was insufficient to identify the specific genes controlling resistance to the disease. So the scientists began adding layers of information obtained from other approaches. They sequenced genes from these regions to look for differences in those sequences between the two breeds. Analyzing the vast datasets created in this research presented significant computational challenges. Andy Brass and his team in the School of Computer Science at the University of Manchester managed to capture, integrate and analyze the highly complex set of biological data by using workflow software called “Taverna,” which was developed as part of a UK e-Science initiative by Manchester computer scientist Carole Goble and her “myGrid” team. This paper, in addition to advancing understanding of the cascade of genes that allow Africa’s N’Dama cattle to fight animal trypanosomiasis, reaffirms the importance of maintaining as many of Africa’s indigenous animal breeds (as well as plant/crop varieties) as possible. The N’Dama’s disease resistance to trypanosome parasites is an example of a genetic trait that, while not yet fully understood, is clearly of vital importance to the continent’s future food security. But the continued existence of the N’Dama, like that of other native “niche” African livestock breeds, remains under threat. If further research confirms the significance of these genes in disease resistance, a conventional breeding program could develop a small breeding herd ofdisease-resistant cattle in 10–15 years, which could then be used over the next several decades to populate Africa’s different regions with animals most suited to those regions. Using genetic engineering techniques to achieve the same disease-resistant breeding herd, an approach still in its early days, could perhaps be done in four or five years. Once again, it would be several decades before such disease-resistant animals could be made available to most smallholder farmers and herders on the continent. Courtesy: The International Livestock Research Institute (ILRI).